This mutli-sport inflated arena is the most versatile of any inflatable game rental. 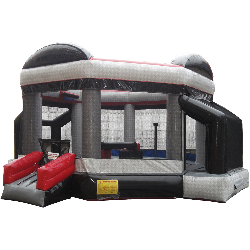 Use it at your next party to joust, play basketball, play soccer or as an awesome bounce arena for the kids. This inflatable party rental has something all ages can and will enjoy! A ball, joust poles & pedestals come standard. Diamond plate design gives it an edgier look. High walls provide a safer play area. Includes built-in soccer goals and basketball hoops. Note: Not for rain use. Add oversized-boxing gloves to make it a bouncing boxing ring for only $50 more. Requires 3.5 foot wide pathway to setup location.